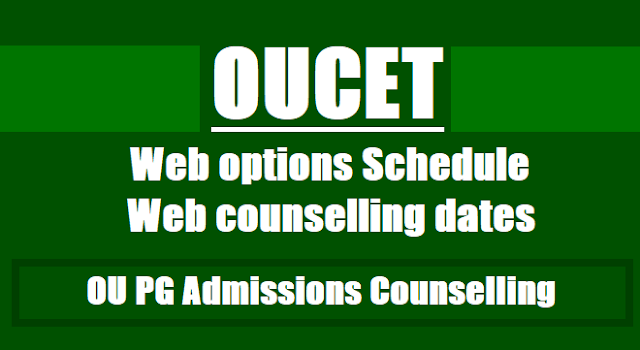 OUCET 2018 Web Options: Notification for Web Options, Web Counseling schedule for 5 years Integrated Courses, MA,MSc,MBA,MLISc 1 year course: It is hereby informed that the exercising of 2nd Phase web options by all the qualified candidates in OUCET 2018 (in the courses in which the options were exercised during 1st phase) will be commenced from as per schedule 2018. The web options given during 1st phase are no more valid and stand cancelled automatically. Therefore, all those candidates who wish to participate in the 2nd phase must exercise their options freshly. Those candidates who were allotted an admission in the 1st phase can also exercise the options if they wish to slide the admission from one college to other college. - Notification for Web Options in Osmania,Telangana, Mahatma Gandhi and Palamuru Universities, its Campus, Constituent and University PG Colleges. It is hereby informed that the exercising of web options for all the qualified candidates of OUCET-2018 will be open from ..... by 4 pm. All the candidates have to exercise their web options freshly for possible sliding and for new admissions. The detailed notification and related instructions will be made available in the website, www.ouadmissions.com. Candidates are advised to go through these instructions carefully. Note:- The list of provisionally allotted candidates will be available on .... after 8 pm. The schedule for certificate verification/sliding of allotted candidates will be available along with the allotment. It is hereby informed that the exercising of web options for all the qualified candidates of OUCET-2018 will be open from ... Further, online registration and exercising of Web Options for all eligible candidates of M.Lib.I.Sc. (1 year course), & 5 yr. Integrated Courses will be open from from ... Candidates can edit / change their web options on .... The candidates exercising web options must note that the web options exercised during 1st phase are no more valid and stand cancelled completely. Therefore, all the candidates have to exercise their web options freshly for possible sliding and for new admissions. The detailed notification and related instructions will be made available in the website, www.ouadmissions.com. Candidates are advised to go through these instructions carefully. Further, the manual counseling for admission into M.P.Ed. will be held on .. at 9.30 am at Directorate of Admissions, OU and all PG Diploma courses manual counseling will be held on .... at 9.30 a.m. For schedules, visit the website, www.ouadmissions.com. 1. All the candidates, who have qualified in OUCET-2018 entrance tests can exercise 2nd phase of web based options in the respective subjects and choose the colleges as per the candidate’s preference. The exercising of options is open to all whether they have exercised options during 1st phase or not. Candidates should note that the web options given by them during first phase are no more valid and stand cancelled automatically. Therefore, all those candidates who wish to slide their admission to a better college/course must also exercise the options freshly. Step I. Online Registrations: Online Registration for Exercising Web Options. Step II. Web options: Logging in and exercising of web options by candidates indicating the order of preference to colleges & courses. Step III. Provisional Seat Alloments: Web based provisional allotment of candidates to colleges (based on options exercised and Rank & Reservation). Step IV. Certificate verification: Certificate verification of candidates, who are in the provisional allotment lists. Step V: Provisional admit cards: Issuing of provisional admit cards, if eligible and after payment of the requisite fee (fee details are available in the website). 3. The detailed notification and procedure for online registration and subsequent exercising of web options are separately placed in the website, www.ouadmissions.com. Candidates are advised to go through them carefully. 7. Since it is second phase of web options, candidates are advised to be extremely careful in exercising the options. Those who have already taken admission must note that in case they give options and if they get the allotment, their previous admission will be automatically cancelled. In case they don’t get any allotment, their previous admission will remain as it is. 8. After the exercising of web options is over, the lists of provisionally allotted candidates to different colleges and different courses will be generated through the process of web based counselling based on the options given by the candidates, rank of the candidates in the respective subject and by following the rule of reservation as applicable in the state of Telangana. 9. All those candidates, who are in these provisional allotment lists will be called for certificate verification / sliding of admission and will be issued admit cards provided the candidates are eligible as per the rules. The schedule for certificate verification / sliding of admission will be available from 17.08.2018 through website, www.ouadmissions.com along with the allotment lists. Candidates can edit / change their web options in July 2018. The candidates exercising 2nd phase Web options must note that the web options exercised during 1st phase are no more valid and stand cancelled completely. Therefore, all the candidates have to exercise their web options freshly for possible sliding and for new admissions.Detailed instructions and procedure for exercising web options is available in the website. Candidates are advised to go through them carefully before exercising the options@www.oudmissions.com. Candidates are advised to gothrough these instructions carefully. "The Web Options will commence from .. by 6PM..."
The candidates must note that if an admission is allotted in the 2nd phase of web options, the existing admission (taken during 1st phase) will be automatically cancelled. Therefore the candidates need to be careful while exercising the options. Those candidates who have not given any options or those who have given options during 1st phase but not allotted any admission or not taken any admission during 1st phase can also exercise the web options during this phase. Since this is final phase of web options, all the interested candidates qualified in OUCET 2018 must exercise their options within the stipulated dates. They are also advised to be extremely careful while giving options and ensure that the selected options are finally submitted. The following is the centralized counseling and admission schedule for Five Year Integrated P.G. Programmes (M.A./M.Sc./M.B.A.) offered at Osmania University, Hyderabad, Telangana University, Nizamabad, Mahatma Gandhi University, Nalgonda and Palamuru University, Mahabubnagar for the academic year 2018 - 2018. Fee should be paid by Demand Draft drawn in favour of Director, Directorate of Admissions, O.U. payable at Hyderabad. Necessary arrangements are being made at the venue for obtaining Demand Draft for the required fee. The total fee must be paid immediately on the day of counseling. Candidates are advised to go through the counseling instructions that are available in website: www.ouadmissions.com. Candidates are required to bring the following ORIGINAL certificates alongwith two sets of Xerox copies, two photographs and necessary fee. 3. Transfer Certificate (T.C) from the institution where the candidate last studied. If the candidate is pursuing any course, regular or correspondence, he/she must submit a proof of admission (i.e., Certificate issued by the Head of the Institution). No candidate will be admitted without the submission of original Transfer Certificate (T.C.) or proof of admission if he/she is pursuing a course at the time of counseling. The candidates admitted on the basis of the proof of admission will have to submit the T.C. from the present course within seven (7) days, failing which, the admission will be deemed to be cancelled. An undertaking has to be given by the candidate to that effect. 5. Proof of Local/Non-local status of the candidate according to rules in force. Those who have studied Intermediate, 10th and 9th as regular students need to submit only study certificates from the respective institutions. In case, the candidate has studied in more than one local area in these four years, he/she has to submit study certificate of 6th, 7th and 8th class also. In case of private study or a break in the studies during four/seven years preceding the qualifying examination, a residence certificate from MRO must be submitted. In case of non- local candidates a residence certificate from MRO or employment certificate of parents or other certificates as a proof of their non-local status (see brochure for details), must be submitted. 7. Latest Income Certificate issued on or after 1-1-2018 for the EBC/BC/SC/ST/Minority/PH Candidates whose parent’s income is Rs. 1,00,000/- or below. For SC/ST, the parents income is limited to Rs.2,00,000/-. 2. If any candidate fails to attend the counseling for admission as per the given schedule when he/she is called for admission, he/she forfeits the claim for admission to the course. 3. More number of candidates are called for counseling to fill up all the seats. Therefore, mere attendance does not guarantee a seat. 5. In the case of ST candidates, they should get their status verified by the Director of Tribal Welfare, Government of T.S., before attending the counseling, if necessary. Venue: Directorate of Admissions, Osmania University, Hyderabad. Courses:M.A., M.Sc., B.L.I.Sc., M.L.I.Sc., M.C.J, M.S.W, M.Com Courses. Is there any edit option available in first phase (oucet) ? Please reply me sir.